ColorBar Gold is a premium color-coding label creation software and products group that maximizes the efficiency of paper filing systems. By enabling users to quickly and easily create files that include file headings, color-coded indexing, bar codes, text, images and custom graphic elements. ColorBar makes managing large filing systems much less labor intensive, and virtually eliminates misfiled documents. ColorBar Software creates new file labels on demand using in-house color printers and personal computers. A wide range of ColorBar Professional Services assist customers in the creation of label designs, database integration, high-volume label production, file conversion services and custom indexing development. To complement ColorBar software and services, ColorBar Supplies are special label printing substrates, laminates and filing supply items that have been specifically engineered to give consistent top quality color reproduction from your color printer, and long-lasting durability. Full-featured design and printing software for creating and printing vibrant, color coded labels using your PC and color printer. Create any size label with custom color codes, symbols, text, bar codes and images. Automate label production by using data from virtually any database source. Easy-to-use software for printing color coded labels using your PC and color printer. Print color labels from virtually any data, any color printer. ColorBar Print works with unlimited label designs. Integratable with document management applications. ColorBar Network is the perfect color labeling solution for multiple users. Print labels at multiple workstations from virtually any data source and any color printer. 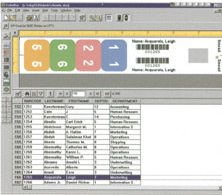 ColorBar Network works with an unlimited number of label designs and is integratable with other software applications. Specifically designed for color laser printers, ColorBar Bright White labels print accurate colors and have special adhesives that will not ooze out as the stock passes through printer rollers, avoiding damage to the printers platen. Available on sheets or rolls. Achieve optimum print quality from inkjet printers using ColorBar Waterguard labels. The unique double coating prevents ink runs, bleeds and fading, even when submerged in water for several minutes. Available on sheets or rolls. Used for overlabeling existing folders, EZ Fold labels are made of an opaque material that prohibits seethrough. The advanced design has a natural fold line that aids in precise alignment when applied to folders. Create your own custom label stock to fit your specific filing requirements. Design labels up to letter size. Available in Bright White or Waterguard stock.